Some of you may have booked a vacation rental property before, but some of you may be wondering "why would I do that?" Well, there are many reasons to book a vacation rental instead of booking a hotel room. Read on to find out why. Room for the entire Family! the community pool, hot tub and tennis courts. 1. MORE ROOM! I don't know how many times as a kid, we were all packed into one tiny hotel room, with two beds, for 5 people! Now those were some sleepless nights. The average hotel room size is under 300 square feet which is smaller than some bedrooms. 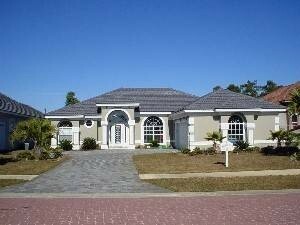 The home in Orlando to the left is over 1900 square feet and rents from $85.00-$109.00 a night! I don't think you can even get hotel rooms for that price. Vacation rentals can afford you a lot more space and are generally a lot less expensive (but we will get to cost savings later). You can book a vacation rental with just one room (like a studio), or you can book something with a bedroom (or 2 or 3 or 4...), bathroom, kitchen, living room, and more! The nice thing is that you have a choice on how big your accommodations need to be, but when you book a hotel room you typically don't have the option for a larger room unless you pay top dollar for one of the few suites they may have. 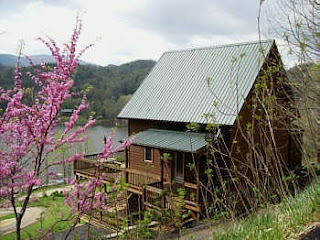 Enjoy the seclusion at this private cabin with lake access in Tennessee! 2. Peace and Quiet! That's what most of us go on vacation for, right? Booking a vacation rental allows you to chose the property that best suites your needs. If you want seclusion, rent a home or a condo in a small complex. If you want something larger with hotel-like amenities, you have that option too! Most often, any of the properties will still be less noisy than a hotel. One time, I was staying at a hotel in Mexico and housekeeping kept coming and knocking on the door over and over asking us if we were going to check out. Yes, we will check out tomorrow, when we are supposed to, not today, now leave me alone it's 8am and I am in Mexico. Relaxing? Not really. Finally, by Noon they stopped asking us if we were checking out, only after I called down to the front desk to tell them what was going on. Like I said, even if you do want to book at a larger property, you will likely have less interference with your relaxing getaway. 3. Cost Savings! I told you I would get back to this. There are so many ways to save money by booking a vacation rental! 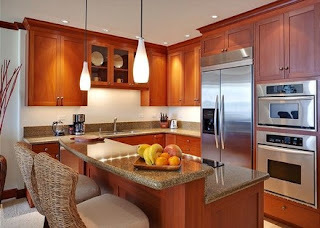 The number one reason is most rentals have full kitchens or kitchenettes. This allows you to make your own meals, have snacks on hand, have beverages in the fridge and not pay gratuity to your server-unless you think your mom deserves a good tip which she probably does. The last time I went to a "resort", and I use that term lightly because it was a barely a hotel, I was charged $6.00 for a can of beer. Six dollars?! Isn't that about how much an entire six pack of beer costs? Needless to say, the next time we went on vacation we had a vacation rental in Florida with a full kitchen. We cooked our breakfast and lunch most days and of course had our soda, water and other beverages nice and cool in the refrigerator. Did you know that the average diner out for a family of 4 is $50.00!? Just by preparing a meal or two you could save about $500.00 a week on meals out and in return spend around 150.00 for the week at the grocery store. Hawaii Big Island Vacation Condo! Another way to save money is paying less for more space. Remember when I was talking about all cramming into one small room? Many families get adjoining hotel rooms on vacation which is double the cost. Vacation rentals give you so much space for the money. If you are searching for a hotel somewhere, you can probably get a full accommodation vacation rental for the same price, or less! Now that you understand a little more about why booking a vacation rental is the best idea for your next vacation, stay tuned for our next blog- How Do You Book, Check in and Check Out of Your Vacation Rental.